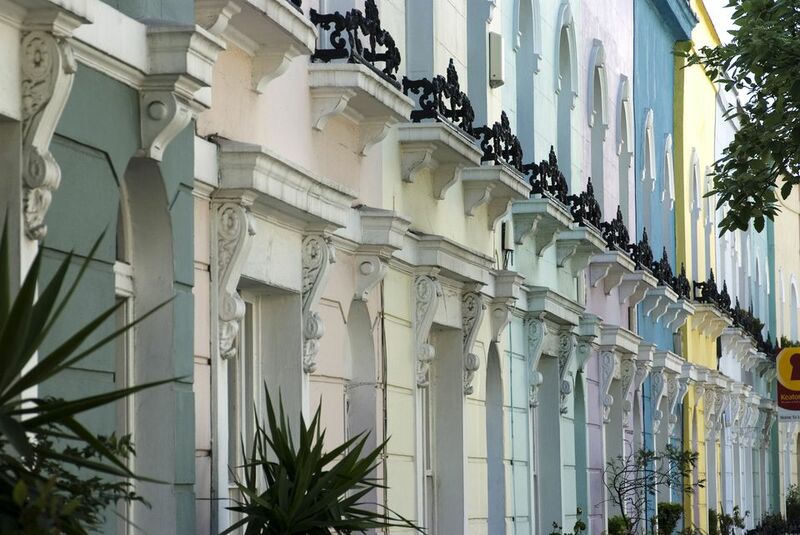 London is a city best explored on foot, and one of the best bits about walking around town is veering off into residential areas to discover pretty streets lined with characterful houses. The city has a real mix of architectural styles from rainbow-colored mews houses on cobblestone alleys to grand townhouses on sweeping crescents. Here's a list of some of London's prettiest streets. Fournier Street is lined with 18th-century merchant houses that were originally built to house wealthy French Huguenots who settled in the area. Many of the houses date to the 1720s and the street is one of the finest examples of early Georgian townhouses in the UK. The Hawksmoor-designed Christ Church Spitalfields sits on the street and the Ten Bells, a pub synonymous with Jack the Ripper, is on the opposite corner of the church. Modern artists Gilbert & George have lived on the street since 1968. How to Get There: Fournier Street is between Commercial Street and Brick Lane in London's Spitalfields neighborhood. The nearest tube station is Liverpool Street on the Central, Circle, Hammersmith & City and Metropolitan lines. There's no shortage of beautiful streets in South Kensington but Kynance Mews is arguably one of its prettiest. Accessed through an arch off Launceston Place, this narrow cobbled lane features colorful wisteria-clad 19th-century properties that were once used as coach houses for the large townhouses on nearby Cornwall Gardens. How to Get There: Kynance Mews is between Kensington High Street and Cromwell Road in South Kensington. The nearest tube station is Gloucester Road on the Piccadilly and Circle and District lines. Just past Tower Bridge on the South Bank, Shad Thames is a historic riverside street lined with converted warehouses. The Victorian warehouses once stored tea, coffee and spices when the area served as the center of London's shipping industry and were converted into luxury apartments in the 80s and 90s. Look up to see the original goods gantries linking the brick buildings. How to Get There: Shad Thames is east of Tower Bridge. The nearest tube station is Bermondsey on the Jubilee line. In the heart of Belgravia, Wilton Crescent is lined with grand white stucco townhouses dating to 1825. A number of prominent politicians and statesmen have lived on the street including Louis Mountbatten, the 1st Earl Mountbatten of Burma and Alfonso Lopez Pumarejo, a former President of Colombia. This sweeping crescent is one of London's most expensive streets to buy property on. How to Get There: Wilton Crescent is just off Wilton Place in the heart of Belgravia. The nearest tube station is Knightsbridge on the Piccadilly line. This narrow cobbled street in Kentish Town is only 8 feet wide and is lined with two-story brick houses that were built in the 1780s. The buildings are Grade II listed so they're protected by English Heritage and it's one of London's few Georgian streets that remains completely intact. The street features in a poem by English poet, John Betjeman and starred in the music video for The Kinks's 1966 song, Dead End Street. How to Get There: Little Green Street is off Highgate Road near the bottom of Parliament Hill park in Kentish Town. The nearest tube station is Tufnell Park on the northern line. Just south of Notting Hill Gate, Hillgate Village is a collection of streets lined with pastel-colored two- and three-story townhouses. The properties were built in the late 1800s and the area sits within the Kensington Conservation Area. How to Get There: Hillgate Village is between ​Notting Hill and Kensington. The nearest tube station is Notting Hill Gate on the Central and Circle and District lines. It's hard to believe this charming street lined with three-story 18th-century brick houses is in the center of London, just a short walk from Oxford Street. The houses were built in the mid 1700s and at the end of this paved residential street is Crabtree Fields, a secret garden in the heart of Fitzrovia. How to Get There: Colville Place is just off Charlotte Street in Fitzrovia. The nearest tube station is Goodge Street on the Northern line. One of London's most colorful spots, Kelly Street in Kentish Town is a beautiful crescent of mid-19th-century houses painted in pastel colors. The road sits within a conservation area and many of the houses are Grade II listed buildings protected by English Heritage. How to Get There: Kelly Street is between Kentish Town and Camden. The nearest overground station is Kentish Town West (for trains between Richmond and Stratford). The nearest tube station is Chalk Farm on the Northern line. Is This London's Coolest Museum?